Soon after I moved to Laramie, I began looking for a place to worship and discovered a Lutheran church that was friendly and welcoming. I felt very comfortable with members of the congregation. The pastor stopped by my apartment one evening, and after visiting with him and asking some specific questions, I felt that the church would be a good fit. I asked for my membership to be transferred, and I officially became a member of the Laramie church in October. To be honest, I hadn't attended church the last four/five years I lived in Riverton. I missed the worship and fellowship and the opportunity to expand my faith, but I didn't feel like the congregation or the pastor shared my idea of a supportive Christian community. Now, in addition to Sunday worship, I participate in a weekly Woman's Bible Study. 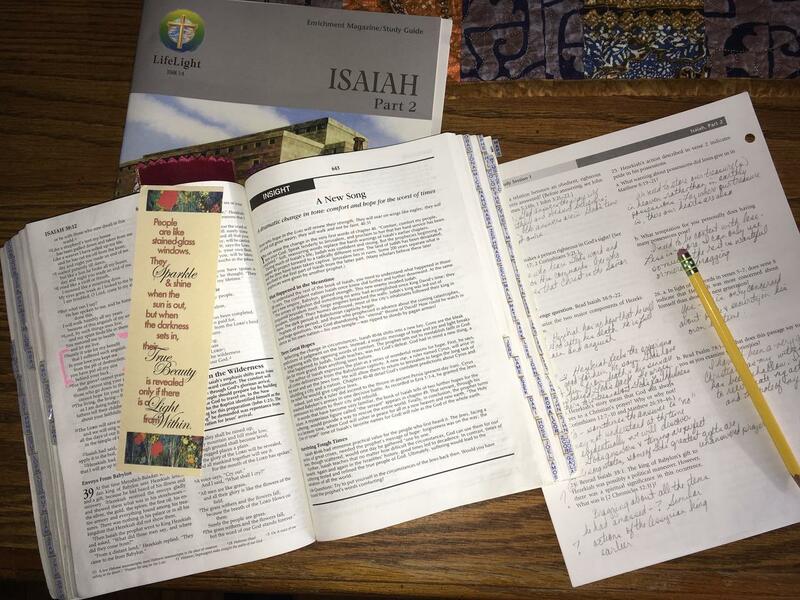 Having finished part one of Isaiah before Christmas, we started part two the beginning of the new year. I typically work on the weekly lessons on Sunday afternoon. Since finding this church and congregation, I feel like my spiritual life is back on track. Good for you! I'm glad you found a church that is a good fit. There isn't one around me that I like - even the one I grew up attending (which would be a hike anyway) has changed and not for the good in my opinion. I'm so happy for you! His word, His Son and His Spirit are the only ways to connect to Him. This is a wonderful thing Nancy! I’m so glad you have found a church home where you can grow in your faith and fellowship with others. It’s so important. The Bible says not to forsake the fellowship with other believers and I know you’ll be a wonderful addition to your church family. I’m very happy for you. So happy to hear that you have found a place of worship that is a good fit. I should make more of an effort to participate in ours. I will admit that I listen to our services via their streaming program instead of driving to town. I think that can make a big difference in how you feel about being anywhere, and I'm glad you found a group that you feel are compatible. These days it's not that easy. It's hard to make those changes and find a good fit. Finding a new doctor and a new hairdresser would fall into those same categories for me. My daughter and her husband had to "audition" several churches before they found one they really love. Glad you found a welcoming church! Nothing is better than having the comfort of a Church home base! I haven't taken time for a regular Bible study in years and I think it about time to rejoin that comfort as well. Thanks for the reminder Nancy. Yeah! I know how it is when you find a good fit, so glad you did. How LOVELY. Im sure GOd guided you there! I'm glad you found your good spot. Sounds like Laramie agrees with you on MANY levels. Nancy, I grew up in a small country Baptist church. For Sunday School, 35 was a high attendance number. I have lived in the Dallas - Fort worth area since 1976. They have Mega churches here. I don't feel comfortable around large crowds. I'm so glad you found your church family. i miss mine!